Primary teachers often plan themed units to integrate learning for young students. The Ladybugs unit is the latest addition to Mathwire's Math Activity Themes collection. The mathematics activities include ladybug glyphs & graphing ideas, mats, problem solving, math-literature connections, games, music and links to additional internet resources. Suggestion for Morning Math Routines: Place a ladybug template in a sheet protector or laminate the ladybug. Use a dry-erase marker to add a new spot each day. 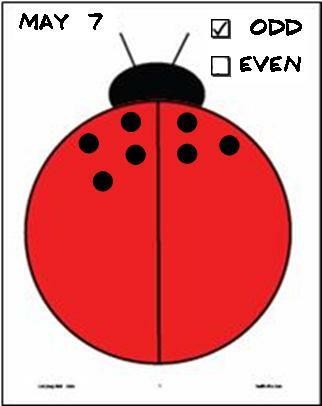 Discuss whether the ladybug has an odd or even number of spots, based on whether there are the same number of spots on each side of the ladybug. Incorporate this practice into morning routines to reinforce odd and even numbers. 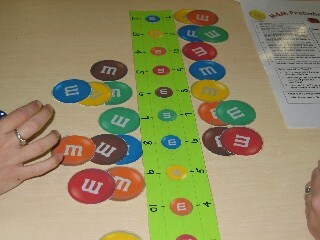 Check out Mathwire's new Ladybug Math. Review all Mathwire Math Activity Themes and bookmark for future reference. Who Has? : Provide practice decks for classes to use in every day timed events. 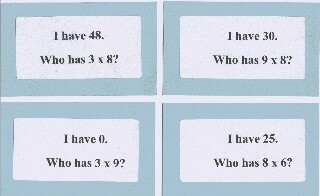 Plan a grade-level competition to see which class is best by challenging students to compete using an unfamiliar deck. Check out the Mathwire collection of ready-made Who Has? decks, complete with classroom management ideas and suggestions. Mad Minute Mayhem: Encourage students to develop basic facts proficiency by providing regular practice, using simple worksheets of target skills: multiplication facts, simplifying fractions, division, etc. Use a class contest to identify Fact Monsters who eat up the competition. Individual students complete the worksheet and write their own time at the top. Students should strive to improve their own time and accuracy with each new round, making everyone who participates a winner. Award certificates, as appropriate, to recognize student achievement and personal improvement. Contig: Hold grade-level playoffs for this engaging game which should be a staple in all middle grade classrooms. Encourage pair play to increase mathematical discussion and strategy between players. Read more about the Contig Game. 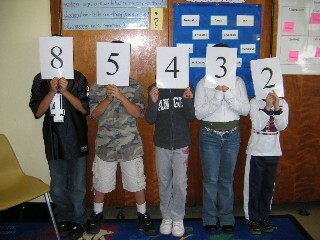 Number Line-Up: Get students up and active by challenging small groups to compete in the Place Value Face-Off. Provide the same numeral cards to two small groups and see which group can more quickly assemble to provide a correct answer. Keep score and increase the challenge with each round to review appropriate place value skills. NOTE: Small groups not currently competing should ACTIVELY practice using small digit cards at their desks. Check out Number Line-Up to read more about this activity and to download number cards and suggested place value activities. Students always enjoy "playing games" in math class, feeling that they're getting away without working. Introduce games for practice of math facts, but add a data-collection component to better analyze the underlying probability and help students use probability to strategize and increase their odds of winning. These activities are perfect end-of-the-year activities as they accommodate the changing schedules and absent students that characterize these closing weeks of school. See Mathwire Data Analysis: Two Dice Toss for games that are effective data-collection activities. The collection includes pictures, PDF handouts and instructions as well as suggestions for data collection and analysis of results. Change up the Morning Routines a bit at the beginning of each new month. This month, for instance, use the Ladybug Mat suggestion [above in feature article] to provide concrete practice in identifying odd and even numbers. Primary students may use their own mats with chips to reproduce the date and classify the number as odd or even or simply draw spots on ladybug mats in their calendar folders.